Tears well up in Naseem Haider’s eyes as he watches his 25-day-old son twitch inside the incubator. Born premature after 29 weeks, this palm-sized infant, weighing no more than a kilogram has a feeding tube piercing through one nostril and an oxygen tube through the other. His vital organs are constantly monitored via wires attached to his body. Born in a private hospital in Uttar Pradesh’s Bijnor district, the baby was given ampicillin, the first antibiotic administered to any premature child for preventing infection. With a heart beat racing from the normal 140 per minute to 170 per minute, he was shifted to the bigger and specialised Mangla Hospital. Here, he was put on a ventilator that pumped oxygen into his underdeveloped lungs. Three days later, he developed hyaline membrane disease, which made breathing difficult for him. He was prescribed cefotaxime, an antibiotic that costs Rs 30 per 250 milligram. The infant showed no improvement. Instead, he developed low blood pressure. Investigations showed he had acquired sepsis, a bacterial infection of blood. Doctors again changed the antibiotic—this time, to meropenem that costs Rs 300 per dose. The baby had also contracted pneumonia caused by Klebsiella bacteria, which is resistant to all antibiotics except two. “We included polymyxin B and colistin in the infant’s regime even though their adverse effects are massive,” says his doctor Vipin Vashishtha, who runs the hospital. One dose of polymyxin B costs Rs 1,400. The infant was given one dose every day. Haider, a taxi driver, cannot understand why the costly drugs cannot cure his son. Hospital expenses alone are between Rs 3,000 and Rs 10,000 per day. Medicines cost Rs 2,000 per day. By now, he has spent over Rs 1.5 lakh on his son’s hospital stay, investigations and medicines. With a monthly income of Rs 5,000, he already has difficulty feeding his family of six. “I have not paid the hospital bill for six days. I borrowed money from relatives and neighbours. I cannot ask for more money. I will have to take my son home,” he says. “The infant has a slim chance of survival,” says Vashishtha, who rues that all the infections were acquired in hospital itself. “Howsoever well the equipment are sterilised, chances of infection are high in critical cases,” he says. The risk is higher for premature babies because of their weak immune system. Vashishtha has reported 14 similar cases of antibiotic resistance in his hospital between April 2009 and February 2011. In all these cases, the antibiotics given were ineffective on bacteria (see ‘Constant one-upmanship’). In his study, published in Indian Pediatrics in February 2011, Vashishtha writes that organisms found in the 14 infants were resistant to all classes of antibiotics—cephalosporins, aminoglycosides, monobactams, quinolones, piperacillin-tazobactam combination and carbapenems. All were administered polymyxin B and colistin, but only eight survived. Four of these eight developed complications like meningitis and arthritis. “Doctors had stopped administering polymyxin B and colistin to patients as their use can lead to low blood count, renal problems and even seizure. But there is no antibiotic left to treat multi-drug resistant bacteria,” says a worried Vashishtha. The microbes have not yet become resistant to these two antibiotics as they have not been widely used because of their side effects and high cost. Antibiotics become ineffective because of excessive and irrational use. “They are prescribed even for viral infections like common cold and sore throat,” says Randeep Guleria, professor of medicine at All India Institute of Medical Sciences (AIIMS) in New Delhi. This helps bacteria constantly evolve strategies to outwit the drugs. “At times, patients do not complete the course of the antibiotic so the bacteria do not get completely eliminated,” he says. World over, doctors are finding ways to slow down the process of antibiotic resistance. Between October 3 and 5, researchers and policy makers from 40 countries met in New Delhi as part of the first global forum on bacterial infections. Worried about the high mortality rate due to antibiotic resistance, they looked into ways to delay resistance to the remaining few antibiotics. What are the options available to reduce use of antibiotics? We have vaccines, diagnostics and antibiotic stewardship. To what extent can these help reduce antibiotic resistance? If effective vaccines are developed against even 10 bacterial diseases, there can be 99 per cent reduction in use of antibiotics. Vaccines are not available at present. So, vaccination cannot be the only strategy. Better diagnostics can reduce use of antibiotics, but it is expensive. As of now, stewardship is the most important option. Programmes held in hospitals and private clinics to ensure correct use of antibiotics will help. Eighty per cent of our efforts should be in this. Industry is developing a vaccine to prevent hospital infections. Diagnostics using microbial DNA and human antibodies will help reduce antibiotic use. Gene Expert, a diagnostic kit for multi-drug resistant TB, has shown this. The meeting was organised by Global Antibiotic Resistance Partnership (GARP), launched three years ago. It is a project of the Washington-based non-profit Center for Disease Dynamics, Economics and Policy. The partnership is mandated to develop policies on antibiotic resistance for four low- and middle-income countries—India, Kenya, South Africa and Vietnam. Participants pressed for striking a balance between access and irrational use of antibiotics. This, said experts, should be through restricting availability of new antibiotics in the community. There should be higher reliance on vaccines to reduce the disease burden. Hospitals can formulate their own infection control policy. They also proposed a ban on sub-therapeutic use of antibiotics in animals. They sought the support of governments, researchers, industry and consumers for the purpose. 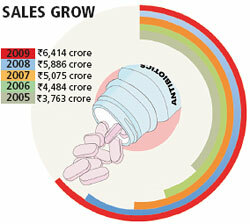 Experts at the GARP meet said studies show a steady growth in use of antibiotics in India (see ‘Sales grow’). Of all the antibiotics, the beta-lactams, like penicillin, were sold the most followed by quinolone antibacterials, like ciprofloxacin. Penicillin is used to treat, among others, wound infections. Ciprofloxacin is given to patients with urinary tract infections. Independent studies demonstrate the immensity of the problem in India, be it due to infection acquired in hospitals or in the community. Doctors classify infections developed 48 hours after reaching the hospital as hospital acquired infections (HAI). Those acquired before 48 hours are community-acquired. “Of all the bacterial infections 80 per cent are community-acquired,” says Anita Kotwani, associate professor at Vallabhbhai Patel Chest Institute in Delhi. How will you balance access and antibiotic resistance? Access to effective medicine and drug resistance is not necessarily a dichotomy. Drug resistance is highly variable. It is not yet a problem in rural areas. But city hospitals use antibiotics more than they need. Will the Indian policy on antimicrobial resistance be able to check over-the-counter sale of antibiotics? India will never be able to ban over-the-counter sale of antibiotics. You cannot stop people from going to drug stores to buy medicines. No one can keep a check on that. Basic drugs should be made available to people. Protocols to diagnose common diseases can be set. Medicines can be given to auxiliary nurse midwives (ANMs) and Accredited Social Health Activists (ASHAs), trained specifically for the purpose, so that they can treat patients. If the symptoms do not fall under the protocol, the patient can be referred to a doctor without being given the medicine. ANMs are very capable of doing this. Penicillin, for some reason, works in India. This can be administered by ANMs. It can cure diseases like pneumonia, which kills many children. The more effective medicines can be kept in hospitals. A study released by GARP in March this year shows that chances of contracting vancomycin-resistant enterococcus, which cause a dangerous skin infection, are five times higher in Indian ICUs than in the rest of the world. A study conducted in a tertiary hospital in Bengaluru in 2007 found that 36 per cent of Acinetobacter, which causes HAI, had become resistant to ciprofloxacin. Another study in 2008 conducted in Benaras Hindu University showed more than 80 per cent of the isolates of Acinetobacter in hospitals were resistant to second and third generation cephalosporins, aminoglycosides and quinolones. Researchers at AIIMS found that in the recent years Salmonella, that causes typhoid, has become resistant to ciprofloxacin. This antibiotic had replaced ampicillin and chloramphenicol. Researchers at the Indian Council of Medical Research found Shigella, a diarrhoea-causing bacterium, resistant to cephalosporins in Andaman and Nicobar Islands. The antibiotic was adopted to counter the bacterium after it became resistant to quinolones. Up to 14 per cent of the stool samples with Shigella showed resistance to three third-generation drugs, indicating grave danger to public health. The situation is grim in urban slums as well. In a study conducted on people of Kolkata’s slums between 2004 and 2009, a team of National Institute of Cholera and Enteric Diseases found highly resistant Vibrio cholerae strains. These were resistant to tetraglycine, the drug of choice for cholera. In May 2011, a team of scientists found highly resistant varieties of E coli and Klebsiella in the gut of patients. Antibiotics have made their way to the environment as well. Cattle, for instance, harbour resistant bacteria that could pose a problem to humans who come in contact with them. Why are most drug companies walking out of antibiotic development? A drug takes about 10 years to enter the market after being discovered. Its patent life is 20 years, after which it becomes generic. By this time the antibiotic becomes resistant. Pharmaceutical companies do not see attractive incentives in this business. There is deficiency of innovation in the industry. Companies and research institutions should collaborate on a risk-reward-resource sharing basis to discover novel drugs and vaccines. Chances of developing resistance are least in vaccines. Except in acute cases, it is best to strengthen man’s immunity than use antibiotics. This is what bacteria do. They become resistant before being attacked. We have to strengthen our collective immunity. Bacteria have been around for several billions years before man and know how to survive. What is the status of vaccine research? Despite the potential of this tool, we are yet to find the right way to use it. What is your organisation working on? As a drug discovery innovation subsidiary we are developing new molecules to fight resistance either by directly hitting the bacteria or their defence mechanism. We are focusing on developing stronger beta-lactamase inhibitors since these molecules will restore the activity of earlier antibiotics by simply inhibiting the enzymes that destroy them. In 2006, researchers at the department of veterinary microbiology in West Bengal University of Animal and Fishery Sciences isolated 14 strains of E coli from the faecal samples of two cows and six diarrhoeic calves. Ten strains were resistant to at least one of the antimicrobial agents tested. Multiple antibiotic resistance was frequent. In 2008, multiple drug-resistant strains of E coli were found in calves in Gujarat. Resistant bacteria are also lurking in rivers and sewage, risking lives of those living in the vicinity. In 2009, scientists at the Indian Institute of Toxicology Research (IITR) studied several locations along the banks of the Ganga at Kanpur. They found four species of the genus Enterococcus resistant to many antibiotics, including that which treats tuberculosis. The authors contended that enterococci makes its way to the river through sewage from hospitals, industries and households. “The Ganga is a source of drinking water,” says Rishi Shanker, senior scientist at IITR. “People depend on it for bathing and washing. Pilgrims bathe in it. Travel and tourism leads to spread of resistant bacteria,” he says. A similar study conducted by a Swedish team of scientists, published in February this year found high levels of resistant genes in bacteria in a river in Patancheru near Hyderabad that receives waste from pharmaceutical firms. In 2009, another study had documented high levels of antibiotics like ciprofloxacin at the site. Researchers noted that the bacteria found in the river, even if not harmful, could easily transfer the resistant genes to other life-threatening bacteria, creating a worldwide problem. A strong selection pressure by antibiotics in the environment could contribute to resistance. It is difficut to assess at what pace bacterial infections become untreatable, says Joakim Larsson, professor at the University of Gothenburg, who was a part of the team that conducted the study in Hyderabad. The price we might pay for living with the risk could turn out to be very high, he adds. In the battle between antibiotics and bacteria, it is the disease-causing microbe that has the winning edge. But it must lose. To ensure this, many countries have started formulating policies to maintain the effectiveness of antibiotics. In March 2011, the Union Ministry of Health and Family Welfare formulated the National Policy for Containment of Antimicrobial Resistance. 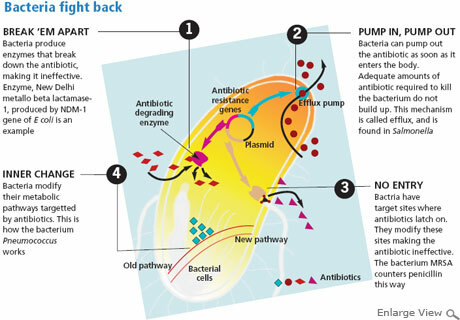 It woke up to the threat of antibiotic resistance after a study, published in The Lancet Infectious Diseases in September 2010, showed that patients in Tamil Nadu and Haryana had bacteria with the New Delhi metallo-beta-lactamase-1 (NDM-1) gene. This makes bacteria resistant to many antibiotics. Spread across Pakistan and Bangladesh, the gene is common in the subcontinent. The new policy aims to collect countrywide data on the spread of antibiotic resistance. The policy also proposes to add more antibiotics to the list of drugs that cannot be sold over the counter. These will be listed in a new Schedule H1 that will be created in the Drug and Cosmetics Act, 1940. The current Schedule H in the Act has 563 drugs. “If any pharmacy sells the listed antibiotics without a doctor’s prescription, its licence will be suspended immediately,” says Ranjit Roy Chaudhury, chairperson of Apollo Hospitals Educational Research Foundation and member of the team that drafted the policy. All third-generation antibiotics will also be colour-coded and made available only in tertiary hospitals. The raging debate has forced the health ministry to review the policy. “On the basis of the criticism, we will add addendums to the policy,” says V M Katoch, secretary, department of health research in the ministry. The first global forum on bacterial infections held in New Delhi provided several viewpoints to the government. It suggested antibiotic stewardship as one of the ways to contain resistance. Under this, hospitals formulate their own policy for judicious use of antibiotics. This ensures correct route (oral or intravenous), duration and course of the drug. The stewardship programme also aims at controlling infection. “But not many hospitals follow this because of lack of incentives, says Randeep Guleria, professor of medicine at All India Institute of Medical Sciences in Delhi. Sir Ganga Ram Hospital in New Delhi and Artemis Medicare Services Limited in Gurgaon already have such a programme. The former regularly releases its own data on the incidence of antimicrobial resistance in its wards and intensive care units. Will limiting sale of antibiotics lead to its judicious use? 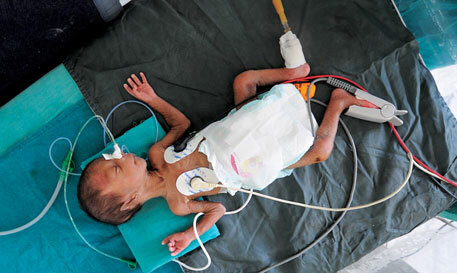 Around 1.8 million children die in India every year. Of this, 0.8 million deaths can be prevented by use of antibiotics. Despite this, government wants to limit sale and make antibiotics available only in tertiary hospitals. I would call this injustice. It is a biological reality that antibiotics have a limited lifespan. So let people who need them benefit today. We should give the largest benefit to the largest number of people. Hospitals are factories of infection and we want to concentrate availability of antibiotics to these centres alone. Instead, they should made available to the community. 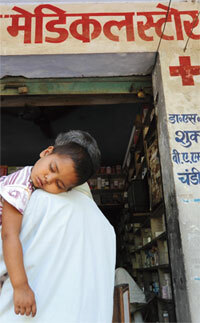 How can medicines reach areas where health facilities are poor? Antibiotics are effective in childhood illnesses like sepsis. We have trained accredited social health activists at 15 places in India. At each place we could treat childhood illnesses by using antibiotics. Similarly in TB-DOTS treatment, breakthrough was made when home treatment was introduced and medicines reached people at their doorsteps. Can introduction of vaccine for pneumonia bring down child mortality? Vaccines are expensive. Vaccine for pneumonia can cover only a few strains of the disease. It offers partial solution. But hospitals are shy of sharing such details as it shows their infection control system in poor light. Between December 2010 and April 2011, Sir Ganga Ram Hospital collected 10,889 samples of blood, respiratory tract infection, urine and pus. It found NDM-1 gene in 8.1 per cent of E coli and 38.02 per cent in Klebsiella pneumoniae. When the hospital released the details it received bad media coverage. Experts fear excessive or irrational prescription of antibiotics by hospitals, who want to portray themselves as the best in the business, may derail the stewardship programme. Sushum Sharma, consultant at Max Hospital in Delhi, gives an example. Ninety per cent of diarrhoeal cases in India are viral, he says, but hospitals still administer antibiotics to most such patients. “Use of antibiotics as a reflex without scientific reasoning is the main reason for creation of drug-resistant pathogens,” says A J Tamhankar, national coordinator for Indian Initiative for Management of Antibiotic Resistance. “Correct diagnosis of an infection is crucial. But the choice of an antibiotic should also be logical and analytical. This is not taught in colleges,” he says. The national policy has also mooted a sentinel surveillance system. By March 2012, it plans to set up a central institution that will coordinate with 50 hospitals and collect countrywide data on antibiotic resistance. This will reveal the pattern of antibiotic use and resistance. The ministry has allocated Rs 400 crore for the exercise, says Chand Wattal, who is a member of the policy-drafting team. Experts at the global meet pushed for increased use of vaccines on children. They argued that vaccination will reduce the need for antibiotics by bringing down the disease burden. But the only available vaccine against bacteria is for pneumococcal meningitis. How big a problem is antibiotic resistance in India? It is huge, but not well recognised. There is no data to show the extent of the problem. In hospitals it has become a menace. And it is the patient who bears the expenses in India. In the US, hospitals take steps to avoid infection as expenses for its treatment are borne by them, not insurance companies. What is the reason for widespread use of antibiotics in India? There is a policy, but it is not implemented. Doctors use antibiotics irrationally to treat diseases. Diagnostic laboratories are not well organised, which is why doctors do not trust their results and prescribe antibiotics without them. Public health experts say it is too expensive to be introduced in immunisation programmes in developing nations. Its efficacy has not been established even in the US, where it was introduced years ago. Keith Klugman, professor of global health at Emory University in Atlanta, has conducted several studies on this subject. One of these concluded that the proportion of the strains of the bacteria S pneumoniae in children in the US decreased after four years of administering them PCV7 vaccine. The strains not covered by the vaccine became dominant. One of the strains 19A is resistant to all antibiotics. Not everyone is convinced. “It is just a philosophical suggestion that vaccines will help where antibiotic is resistant,” says Jacob Puliyel, paediatrician at St Stephen’s Hospital in New Delhi. “Whether you give antibiotics or vaccine, you are putting selection pressure on the microbe. It will find ways to survive,” he explains. Another way to reduce overuse of antibiotics is to improve diagnosis. This will help in speedy identification of diseases and rational prescription. The existing disc diffusion method, which studies the growth of bacteria in the presence of antibiotics is a long drawn process. “It is also heavily dependent on the expertise of the technician,” says B R Das, head of research and development department at Super Religare Laboratories in Mumbai. “Since the technique takes many days, a patient cannot be left without treatment, especially if he is very sick,” says Das. It is at these times that incorrect antibiotics are administered. Laboratories are now moving towards improved technologies to determine susceptibility of a bacterial strain. They measure the Minimum Inhibitory Concentration—the lowest possible concentration of an antibiotic—required to knock out bacteria. But it is expensive and out of reach of the poor. Introduction of rapid test methods is the need of the hour. Pharmaceutical companies have stopped researching on new antibiotics. This is why there are very few new antibiotics to look forward to, says Otto Cars, chairperson of ReAct, a network of scientists, researchers and clinicians working to find ways to reduce antibiotic resistance. Last year, GlaxoSmithKline designed an antibiotic similar to quinolones in structure. It uses a novel mechanism to block enzyme needed by the bacteria to reproduce. However, it will take years for the antibiotic to reach the market. At present, only two recently approved antibiotics—ceftaroline and telavancin—show promise to some extent, says Gerald A Capraro, medical director at Louisiana State University Health Sciences Center in the US. Ceftaroline belongs to fifth generation of cephalosporin class of antibiotics. It has been found effective in treating community-acquired pneumonia and some skin infections. Telavancin also treats some skin infections. “Neither attacks novel bacterial targets. They attack the cell wall synthesis pathway in a slightly more effective fashion,” Capraro explains. In absence of new molecules, industry has also started experimenting with snuffs and ointments from the existing molecules. Pharmaceutical companies are losing interest in developing antibiotics because of poor investment returns. “In the US, the regulatory environment has had a chilling effect on new discovery and development,” says Brad Spellberg, associate professor at the University of California, Los Angeles. With the US Food and Drug Administration (FDA) approving very few drugs in the recent years, companies prefer not to develop them. Data with the Infectious Diseases Society of America indicates that FDA approved only seven drugs between 2002 and 2011. One way to promote research would be to hand over manufacture and sale of drugs to the government after it is discovered, says Raman Sardana, secretary, Hospital Infection Society India. “This will check aggressive promotion of drugs by pharma companies. Government can compensate them for research,” he says. But such methods adopted in the past have failed to promote research on drugs for neglected diseases like kala azar, malaria and tuberculosis. Antibiotics overdose is one of the reason considered for microbial resistance against antibiotics, where poor sanitation facilities are blamed. The hospitals remains in more focus because (1) the drugs resistance cases are detected here and (2) the hospital wastes contains cocktail of medicines. However solid waste generated from hospital, known as Biomedical waste is sent for incineration but what about wastewater generating from hospitals. In India, we dont have a full proof wastewater treatment mechanism and in most of the cases, it is found that the untreated hospital effluent could find its way in storm water channels or other drains. The drains carrying sewage and other effluents always have high levels of active pharmaceutical ingredients (API). This provide the microbes a cocktail of drugs and some of these species develop resistance against them. The STP's have found to contain most of the drugs used for treatment. Thus it is the need of the hour to make some policy, by which we can reduce the drugs levels reaching to the water matrices. The by-back scheme of unused medicine can bring the vital change and the better ETP/STP in the hospitals and municipalities could help in reducing the threat. Very few reporters take the pain to explain health and science issues in a manner that comes clear to the layperson. This story seems to have done that. This is the first DTE story I read ... Great insights on antibiotic resistance. And a picture that can shake you out of the slumber of indifference. With reference to the problem of antibiotic resistance in India, Dr.Ramanan Laxminarayana, Director, CDDEP. told we can't ban over-the-counter sale of antibiotics in the country. I think it could be possible, if the government takes stern action against over-the-counter sale of antibiotics. The government should create awareness in the public regarding antibiotic resistance and antibiotics availability. Then they can understood and will decrease misuse of antibiotics. N.Ramesh Coordinator - Trichy - IIMAR PhD Scholar Dept of Microbiology, Bharathidasan University Trichy, Tamil Nadu.